Recorded in various spellings including Hallard, Hallward, Halward and Hellard, this is an English locational surname. It probably originates as a medieval occupational surname, and as such describes a warden of a 'halh'. This may mean hall, as in manorial hall, or it may describe a 'place'. This could be as general as a wood or forest, or it may refer to a local meeting place, the council 'halh' for instance or even a market place. 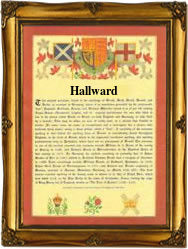 The surname is first recorded in Yorkshire in the year 1379, when one Edward Halwrd appears in the Poll Tax rolls for the city of York in the reign of King Richard 11, 1377 - 1399. Later examples taken at random from surviving church registers include: Elizabeth Hallard, who married Richard Bradwood at the church of St Katherines by the Tower (of London), on December 17th 1651, whilst on July 1st 1784, the Rev. John Hallward married Miss Mary Lambard at St George's Chapel, Hanover Square, Westminster. Occupational surnames were amongst the first to be created in the 13th century, however they usually only became hereditary if, and when, a son followed the father into the same occupation. This accounts for why skilled trade names are quite popular, but status names such as this one, are much rarer.